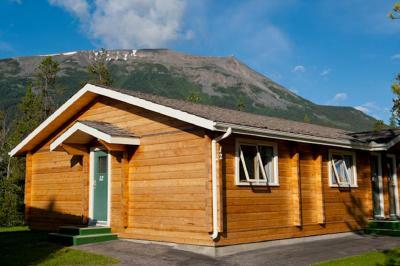 Lock in a great price for Jasper House Bungalows – rated 8.5 by recent guests! Cozy little place on the middle of amazing nature - we woke up to elk grazing right outside our window! Quaint cottages reasonably equipped, we managed to cobble together s thanksgiving dinner and the staff helped us out with a few extra cooking things which was really nice. Bed was super comfy. Plenty of hot water for jacuzzi tub. Loved the fireplace. Balcony overlooking the river was great! Awesome views. Loved going hiking along the river. 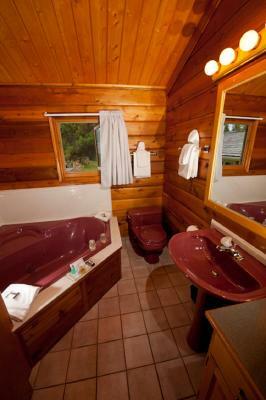 Rustic bungalow was comfortable with modern kitchen and bath amenities. Rooms were comfortable, but small. Staff was very friendly. No complaints, really. 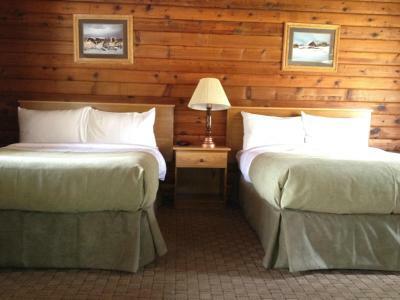 The surroundings are gorgeous, and make the stay very worthwhile. 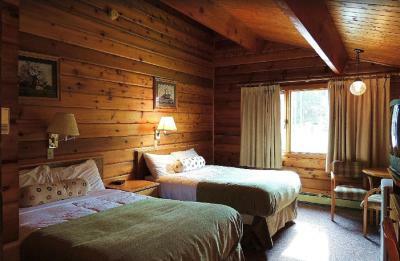 Cabins where clean , spacious and had amazing view, the staff were friendly . The restaurant on site was very good! Elk tacos were especially flavorful, but all items we had were good and used fresh ingredients. Great location. Very close to animals. Clean and quiet. This place is fabulous! It was a good location and clean. It was a little small for 4 adults. We had our 2 adult children with us. Jasper House Bungalows This rating is a reflection of how the property compares to the industry standard when it comes to price, facilities and services available. It's based on a self-evaluation by the property. Use this rating to help choose your stay! 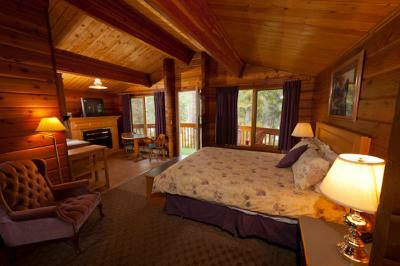 Located in Jasper National Park, these private suites are a 5-minute drive from downtown Jasper. The property offers walking trails. Elk Village restaurant provides breakfast and dinner service daily. 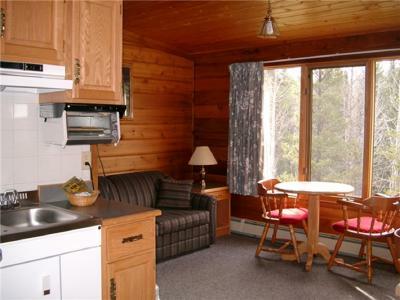 A satellite TV and a seating area are featured in each room at Jasper House Bungalows. 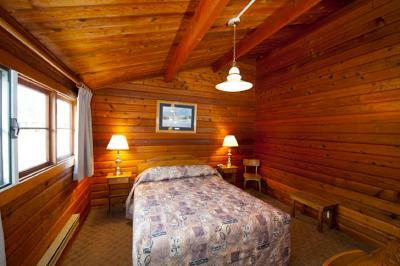 Wood paneling and large windows are offered. This 3-acre property features views of the surrounding mountains, as well as horseshoe pits and boccie ball. Free newspapers are available. A nature guide hosts brief talks on the local wildlife and surroundings during the summer months. 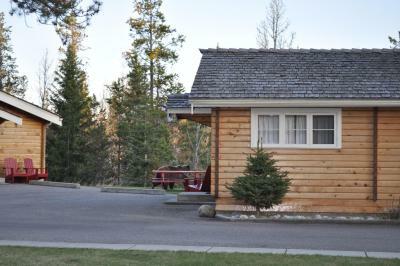 The Bungalows at Jasper House are located along the Athabasca River. 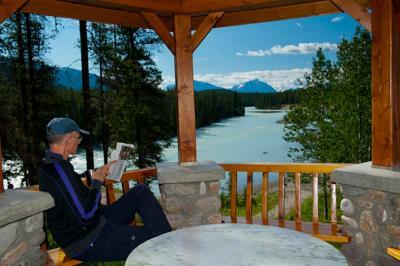 Jasper Park Lodge Golf Club is 7.5 miles from the property. 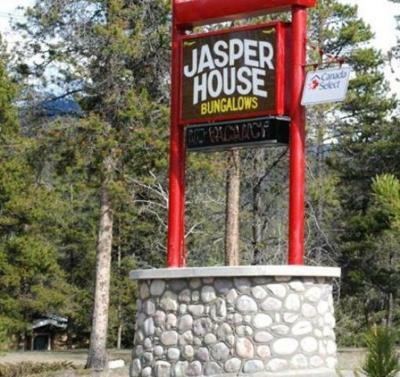 When would you like to stay at Jasper House Bungalows? A kitchenette is featured in this room. Satellite TV is included. A sofa bed is available. Please note this suite can accommodate 2 adults and 1 child under 7 years of age. This spacious suite features a living area and small kitchen. This suite offers either one queen bed or two single beds in a private bedroom, a double bed in an alcove area and all suites include a sofa bed. 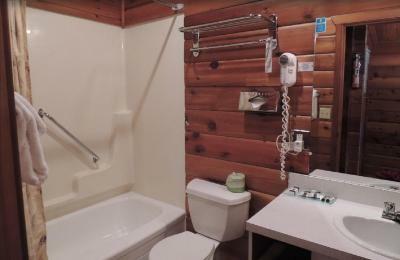 Please note this suite can accommodate a maximum of 4 adults. This suite features a spa bath, electric fireplace, and a private balcony with views of the river. Please note, this suite can accommodate a maximum of 2 adults. 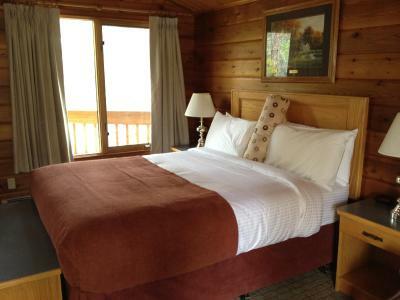 Offering a river view, this room features a kitchenette and 1 queen bed in the private bedroom. Satelite TV is included. This room has a fridge and coffee-making facilities. Please note that this suite can accommodate 2 adults and 1 child under 7 years old. House Rules Jasper House Bungalows takes special requests – add in the next step! 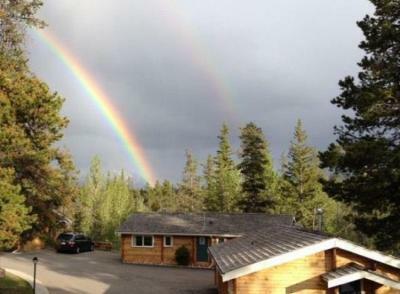 Jasper House Bungalows accepts these cards and reserves the right to temporarily hold an amount prior to arrival. Please note, maximum occupancy is strictly enforced due to fire and safety regulations. The room was pretty small - when they say room for four and no more they meant it! But it was cozy nice. Would def go back again. It indicates 2-6 people. There were only 4 of all dishes/cups & 1 wine glass. Not a full compliment of cutlery & one roll of toilet paper. I did go to the front desk & ask for more of this but I was disappointed I had to do this. As well it indicates that they supply things such as shampoo etc. The tiny bottles would not wash one person's hair unless extremely short so a little misleading. Though they did tidy up each day, we left recycling on the table & it was never taken away just straightened up on the table. The location was great, 5 mins. 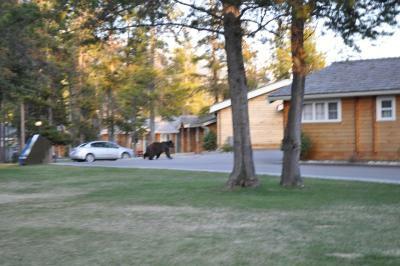 from the main town of Jasper, the look of the cabins & grounds were nice. Beds & bedding very good. I was confused when booking. Paid for a 2 bedroom place, only needed 1. Good place and viwe the river. Sofa was hard and uncomfortable. Furnace in room was loud. No ventilation so all windows were dripping with humidity from a shower. TV had very limited choices and poor reception. Wifi very poor at this location, whereas other locations (hotels) I found were much better. 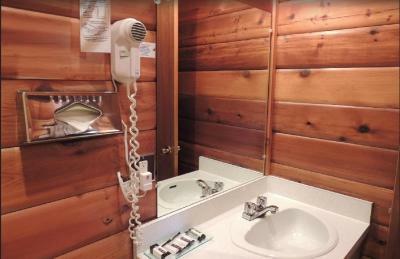 There's a certain charm to well- worn rustic older cabins - but the cost of $390.00 was too high for these units! It was right by the forest and we could see elks! It really lives up to its name of elk village. We heard Elks baying in the night, and In the morning, we saw two female elks and a male elk grazing right by our cabin. Since we got a whole house to ourselves, it was also spacious. More than enough space for four. The staff was also hospitable - made me feel like they went above and beyond to personalize the trip for me. They knew my name and greeted me at the counter, gave me some tips on where I could see more wild animals, and some of the best attractions of Jasper. Thanks, Jasper House Bungalows Team! The kitchen lacked any cooking utensils. We had a large cabin by the river and it was fantastic. Clean, comfortable and lots of peace and quiet. Such an amazing bungalow! 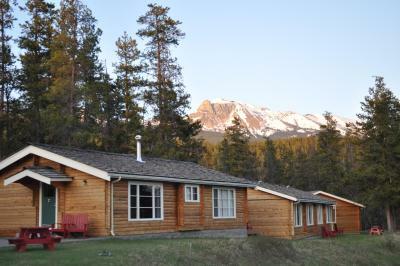 I was speechless when I arrived and also sad when I had to leave after just one night... Would recommend it to everybody, who wants to stay in a comfortable bungalow next to the river and just a 10min drive to Jasper downtown. 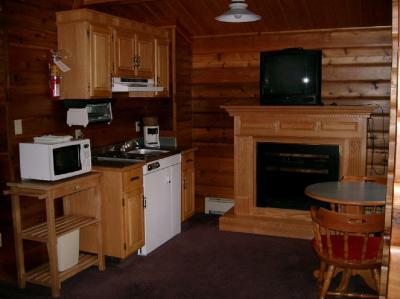 There was also a kitchen in the bungalow with all the equipment you need. Just an amazing place to stay!